Tamara Ball directs the IDEASS program. UC Santa Cruz undergraduates will demonstrate green technology projects developed in collaboration with community members during an event on Friday, October 3, from 5 to 9 p.m. at the Monterey Bay National Marine Sanctuary Exploration Center in Santa Cruz (35 Pacific Avenue). The event is free and open to the public. The "Seeding Innovation" event highlights the work of a UC Santa Cruz program called Impact Designs: Engineering and Sustainability through Student Service (IDEASS). 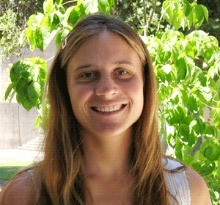 IDEASS was started by Tamara Ball, project scientist and program director under the supervision of Michael Isaacson, professor of electrical engineering and director of the Center for Sustainable Energy and Power Systems in the Baskin School of Engineering. Environmentally-oriented businesses in Santa Cruz County, including electric Zero Motorcycles and City Blooms microgreens, will also attend the event. "'Seeding Innovation' is meant to be a forum for the community to come together and talk about how we're going to live sustainably, particularly through green technology," Ball said. "We hope that people who come in the door will be inspired by what the students have been able to accomplish, and they will bring fresh ideas and needs for new projects." About 30 students enroll in the year-long IDEASS program each year, Ball said. She connects the students to community mentors, often retired professionals or groups in town that have available projects. Working on the projects gives students hands-on experience that may not be available in some internships. Projects from last year's IDEASS students will be showcased at the "Seeding Innovation" event. These projects include a waste-to-energy demonstration, advanced materials for energy storage, and sensor networks that could be used for smart irrigation systems that deliver water only when the soil is dry. 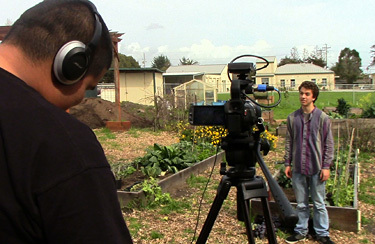 Videos documenting the projects, produced by high school students training for green careers at Natural Bridges High School/Career Training Center in Santa Cruz, will also be shown at the event. Their collaboration with the IDEASS program is funded by a National Science Foundation grant for Apprenticeships in Sustainability Science and Engineering Design. Ball said she started IDEASS four years ago when she recognized that groups in Santa Cruz were launching creative innovations for sustainability and that undergraduates at UCSC had skills that could be useful to the projects. Ball wanted to bridge the divide between talent on campus and talent in the community, so the groups could benefit from each other's skills. Students from any major may apply for the program. Ball said many students are studying engineering or environmental sciences, though she has had students in the program studying physical sciences, like chemistry and physics, or social sciences, like anthropology. Students in the program get support and mentorship from several sources: their project mentors in the community, instructional staff at the university who help the students operate equipment like a 3D printer or a scanning electron microscope, and their fellow students. The group meets weekly for a seminar that covers professional development and project management skills. The seminar is also time to discuss sustainability in the news or take local field trips to see sustainability projects. "The idea is to keep expanding the students' minds about the broader contexts in which their projects are occurring," Ball said. The IDEASS program is affiliated with the Department of Environmental Studies, the Baskin School of Engineering, the Office of Sustainability, and College Eight. This fall, the program is listed as the capstone course for a new minor in sustainability studies offered through College Eight. This is the first minor offered through a college rather than a degree program. "This reinforces the idea that the program is open to all majors, that all expertise is needed to address these issues," Ball said. She predicts the program will quickly be overenrolled. "The students really want it. They want to learn by doing. They're starving for it."